Mark Knopfler’s “Sultans” Strat (ser.-no. #68354) is from 1961. 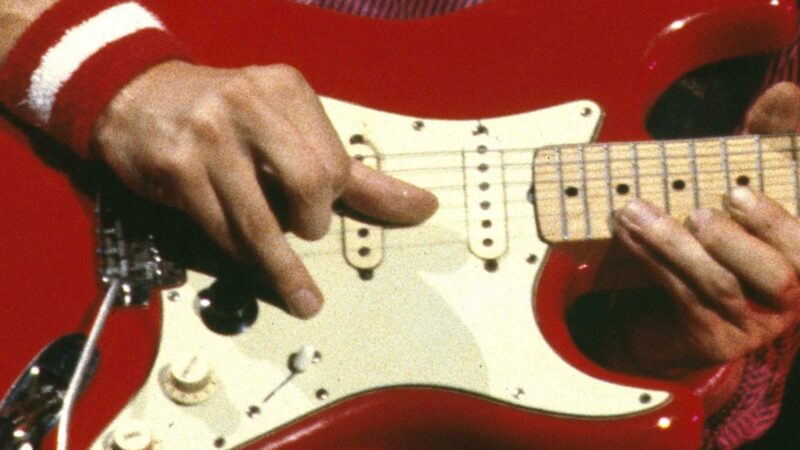 The second red Fender Strat he played with Dire Straits (ser.no #80470) was from about the same period (apart from the question in how far it was original Fender at all). For this reason I put together a table to give you a survey about the distinctive features that are different on a 1961 Strat compared with earlier or later Strats. Another remark about Headstocks : It was indeed larger from 1965 I think (Tony Joe White has one from 1965 on the cover of the album where he plays with Mark, and the headstock is a bit larger than 50 and early 60 models), but it was a “little” larger. Then, from 1968, it had the “very” large headstock (like hendrix’s “black beauty”, Gimour’s original “black strat” and blackmore’s one, etc…).But in the 80’s, the small headstock came back, as it is nowadays. That is great Jean. I also hear Mark on an interview and he says this ’61 strat is from sultans on swing around and he says, back then you learn to adjust the little switch to stay between potisions and got this out of phase thing. To me is of course middle +bridge but with a maple neck strat. Like he has the 60’s pickups in to the maple strat. That’s that I found. I know I think exactly the tone for the sultans. Of course you must have the right tubes. Don’t forget that. All those Fender PUs should have the same number of coil turns, and thus the same DC resistance, but in fact they don’t. They are all roughly between something like 5.8 to 6.3, but these are rather individual differences and not constant for particular years. The 5-way switch had nothing to do with Sultans. Besides it was really no problem to get those in-between sounds with the 3-way switch, it was just more stable with the 5-way switch (in fact it was the same switch with just two more notches to make it snap into that position easier). I have 3-way switches on most of my Strats and don’t give a damn about it. 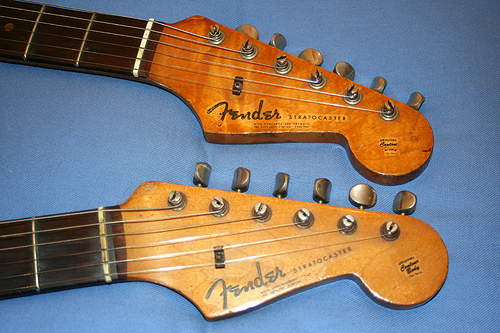 big headtsocks: all 66 Strats have the big one, most 65 the small one. To be more concrete: it seems the change was in December 65, so yes, there are a few late 65’s with the big head. I don’t think there is a difference between the head of a 66 and a 68 or later. The “original contour body” does not mean anything. 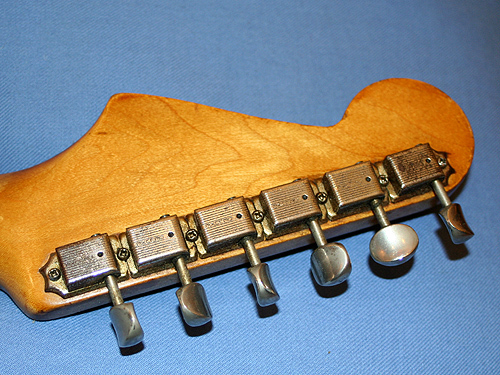 A 74 Strat had it, too, and here the contours were heavily reduced. Is there a possibility to have that strat an ash body insteed of the original alder? 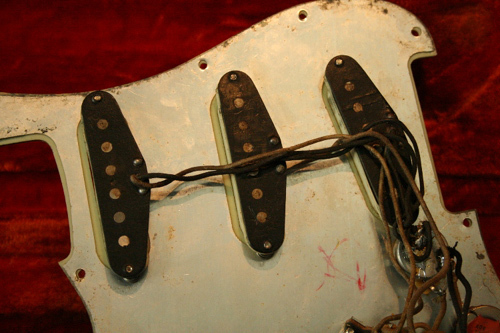 Also those 61 pickups does they have the same materials as a 56 or 57 strat except from the slightly hotter wound? 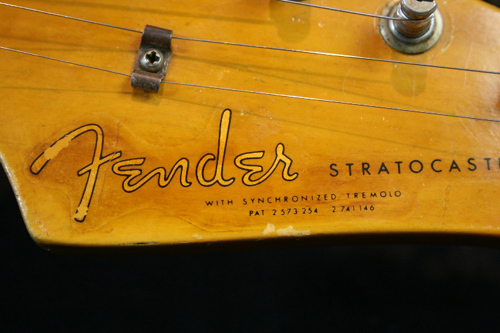 But, I guess that Fender decided to make 5-way switch to make easier to get that sound, and probably because this kind of sound was more and more popular at that time. And reading the Mark’s interview, it looks like HE believed that Fender’s decision was influenced by the success of Sultans. 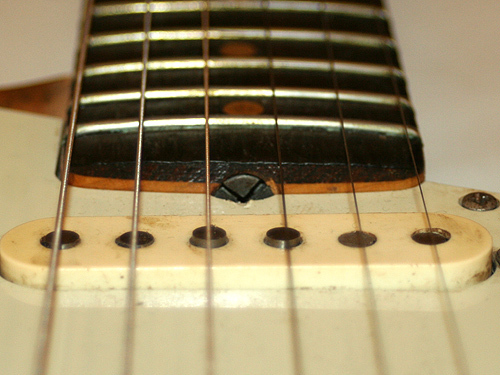 About big headstocks : maybe you’re right. I guess it’s the large and long decal “stratocaster” from 1968 on, which make me think that the headstock is larger. You mean Mark’s 61 strat? While theoretically a 61 can have an ash body (e.g. the blonde ones had, and generally ecverything was possible back then)Mark’s strat seems to be alder. There are only very few pictures around showing it with the bare wood finish it had before it was painted to red, but one of the pics looks very much like alder. The PUs are really similar to those from the late 50ies. 1977 is confirmed by many sources, and the success of Sultans in the US was in 1979. The black Fender decal was introduced in 1968 and might in fact make the head shape appear different. Could you show us these pictures of the strat with the bare wood finish, or are they the ones on the “Clapham Common bandstand” article ? Do you have more ? Do you have any color pictures ? I would die to see Mark with his strat like this. The picture in question is in the Michael Oldfield book on page 46/47 (Mark at the Hope&Anchor…). Need to scan it first. I have the book at home, but can’t check it now. If memory serve, I remember a pic of Mark with the rosewood strat at the end of an early chapter, but the french caption says “Mark at portobello road” or something like that. he has the same clothes as on Chorus, Rotterdam 78, or live at BBC cover. Is it this one ? How are you sure with the date of the pic ? The only other very early pic with a strat featuring on the book, is the one with the maple neck. The others pics seems to be from after summer 78, so in red finish for the rosewood strat. on page 46/47, there’s indeed a pic from “Hope&Anchor autumn 1977”, but with David ! And indeed, altough the pic is B&W, we can clearly see that his strat is bare wood finsih, but I’m not specialist to say what kind of wood it is. But, as Mark is concerned, there’s no pic with him. I have the french edition of the book. Are the pics differents in the english edition ? the other early DS pic I was talking about is on page 77. Mark is with the rosewood strat, and has the same clothes as on Chorus, Rotterdam 78, or live at BBC cover. Thers’s no caption. the “portobello road” is from the text page 76. To me, the finish of the body looks like red on this B&W pic, but I’m not sure. Then the French and the English version are different (not really a surprise). The picture I was talking about is from the Hope&Anchor (you can see the letters “OPE..” on the wall in the background, Mark is wearing some white shirt over a black T-shirt. would it be possible to see this pic ? I hate scanning but will scan this picture a bit later. The decal with 2 patent numbers ion the photo is not the original decal .. the originals had a comma after the first patent number – that decal has been replaced at sometime. Not unusual – many had fallen off or disintergrated within the first 5 years anyway. This is possible. 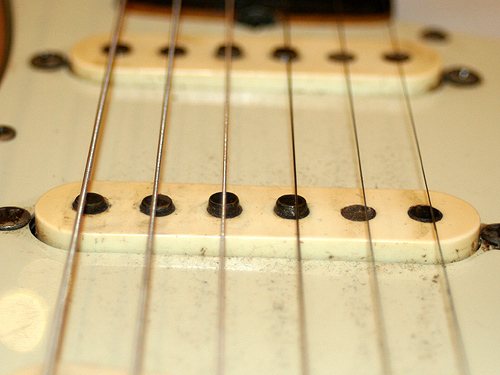 I admit I took this picture of a 61 Strat from google and did not really check originality here. So thanks for the hint.